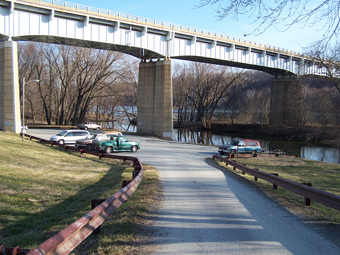 The Brunswick boat ramp has access for larger boats to the Potomac River off Maple Ave. in Brunswick. There are 15 parking spaces. From U.S. Route 340, take Exit #2, Burkittsville Road South to Petersville Road to A Street and Maple Ave. Drive through the railroad parking lot. Another Brunswick boat ramp is located about a half mile downstream at the Brunswick Campground, but it generally used by visitors to the campground.